Great guy...he will be missed. I remembered him from the early rocket days. God Bless! His passing has come as quite a shock to me because it still hasn't really sunk in that he is gone and that I will never get to hang out with him again. I am gonna really miss my old buddy. When you meet someone who is nice to people that is a gem. When you meet someone who is a giving soul even in a commercial environment that is a gem. When you meet someone who is eager to help others before his own needs that is a gem. He was all of that and more. He was beyond a flawless diamond. He was a good man. I was surprised and saddened to hear of Wayne's passing. He was always such a great help in the rocket community. He displayed great patience with me while certifing both level 2 and 3 on hybrids. I think Wayne spent more time helping everybody else get their rocket launched, instead of his own. Wayne, you will be missed. God speed and God bless. I am saddened to hear about this. I only ever met Wayne once at Balls a few years back and talked to him a couple of times on the phone, but from that brief meeting and correspondence I could tell he was an honest and upstanding fellow, as well as being absolutely hybrid crazy. He was a good man who will no doubt be missed by his friends and family, as well as his extended family in the rocketry community. I don't think I ever met Wayne in person, although he was very likely a nameless face at one of the BALLS launches I attended. I do know that he will have played a part in my move into hybrids when I finally accomplish that. He will be missed and I hope that I will get to meet him at that great Launch Control Center in the sky. I pray that GOD's peace and love will be on his family in this time of loss and that GOD will meet ALL their needs and see them through this time. Sorry to hear about Wayne's passing. He was a great help in launching my hybrid projects at XPRS. A very friendly and outgoing person. My condolences to his family. 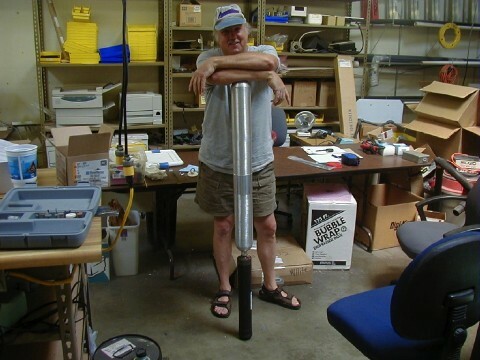 Wayne had a unique approach to rocketry- Try the unthinkable and see if it works. Once,to prove that a rocket made from unreinforced quick-tube could be flown successfully on a Maxi-M hybrid, he supplied the motor free of charge to the person willing to build it. He was right, it worked! Wayne worked tirelessly to promote Hybrids, more than anyone I know. He devoted so much time to helping others, that he once figured he walked 5 miles back and forth from the launch pads on a single day. I will miss going to rocket launches with my friend. Wayne inspired me, and countless others to enjoy rocketry- to fly rockets and just have FUN! Take care my friend! You will be a part of every Hybrid that will ever be flown again. I met Wayne in April 2002 when I came out to Lucerne to fly rockets with my brother. At that launch, he helped me fly the first of many high altitude (for this eastern rocketeer) projects in the desert and was terrific resource for motors and all things hybrids in the years since then. His patience and laid-back attitude made flying hybrids seem no more tricky than any other rocket, and he's a big reason why I continue to fool with them to this day. I will miss seeing him on my annual rocketry pilgrimages to SoCal, and I'll miss getting e-mail responses from China or whereever he hapened to be. My heartfelt condolences go out to his family. I'm sorry for your loss,you was very nice guy , God be will his familly .